Oh my gosh, these fries. Last week, CJ and I hit up McMenamin’s East 19t St Cafe, one of our most favorite joints from our campus days. We used to live dangerously close to this place… like two blocks close. I can’t guess how many times tater tots were ordered after midnight and ciders were drank on sunny afternoons (why is the past tense of drink soooo weird? I’ve googled it about ten times and still can’t figure out if “drank” is correct. Apologies to my past English teachers). Anyways, we had plans to munch a few baskets of happy hour cajun tots when we ventured back down there last week, but then I saw the specials menu. Two words: Bollywood Fries. I die! 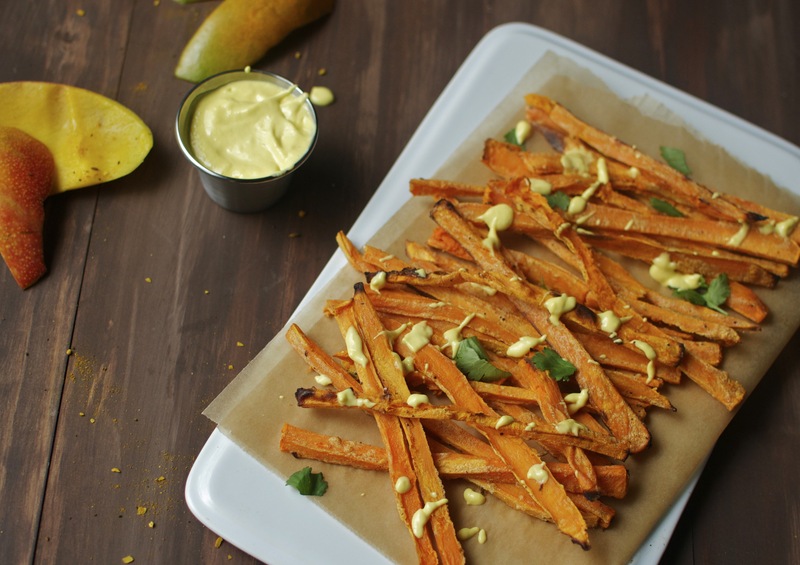 CJ wasn’t too thrilled with the thought of curry-spiced fries and mango mayo, but let’s be honest; his food insecurities have never stopped me from ordering in the past, and they weren’t going to stop me that Saturday night. I don’t trust people who don’t like sweet and savory foods together (at least not when it comes to deciding what to order). 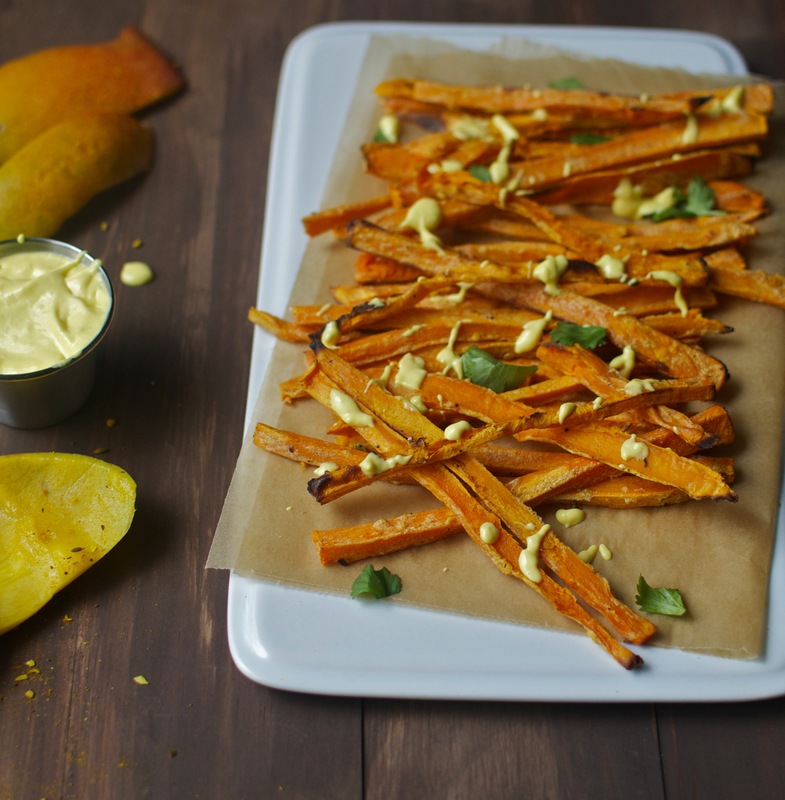 When the fries arrived, I instantly dipped a finger into the mango mayo (seriously… MANGO MAYO! ), closed me eyes, and let that deliciously sweet sauce take me on quite the tasty ride. It was heavenly, with or without french fries (but duh, the fries made it better). CJ was skeptical, but after just one dip he was sold. We gobbled down those curry fries way too quickly, burning our mouths along the way, and before we knew it the mango sauce was gone. 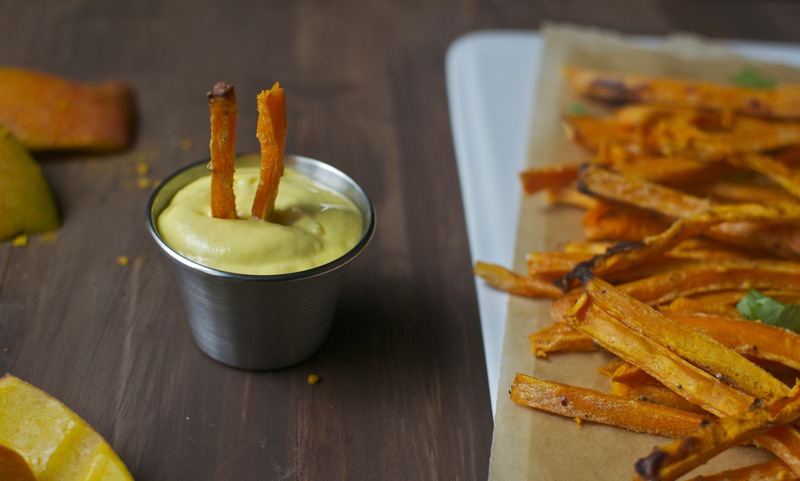 It’s possible that we spent the next 5 minutes blaming each other for using too much mayo per fry dip. We ended up ordering tots with out shared meal (they have the best reuben sandwich ever), and though the tots were good we couldn’t stop thinking about how much better they would have been dipped in the mango mayo. And then the next night we thought about the mayo, and then the next night too. And the night after that and the night after that. Basically, it hasn’t left my train of thought in a week. So, I made some. It’s about time I got things done again instead of day dreaming about mango mayo all day (btw, I used to HATE mayo. I’m still a bit shocked that I now, apparently, am obsessed with it). My plan sort of worked. I did get some things done…. like raiding my fridge and cabinets for every food that might taste good dipped in mango mayo. Oh, and I ate a lot of sweet potatoes. It was an exhausting afternoon. Preheat oven to 400 degrees and line two baking sheets with parchment paper. 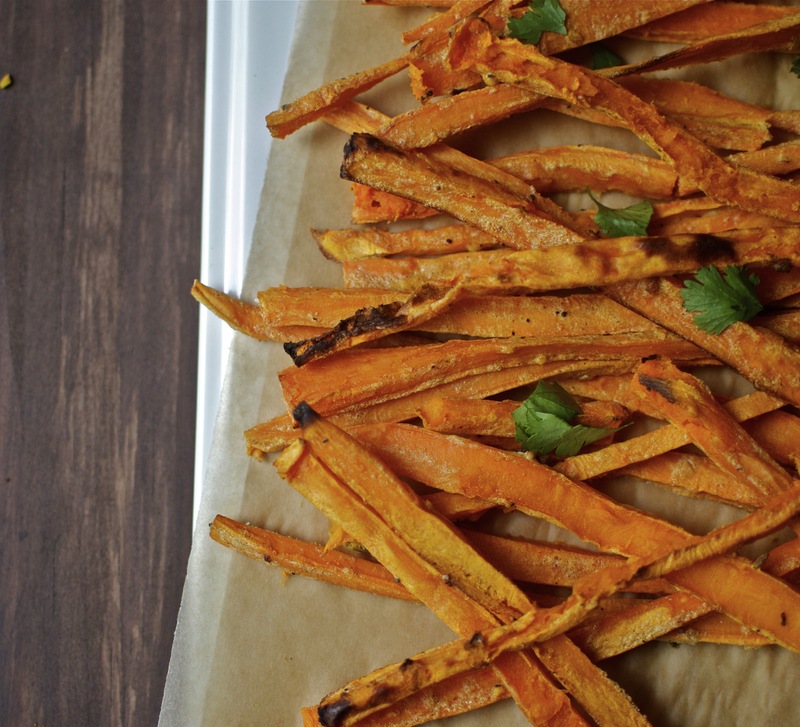 Peel the sweet potatoes and cut off the ends. Cut them into even sized match sticks. 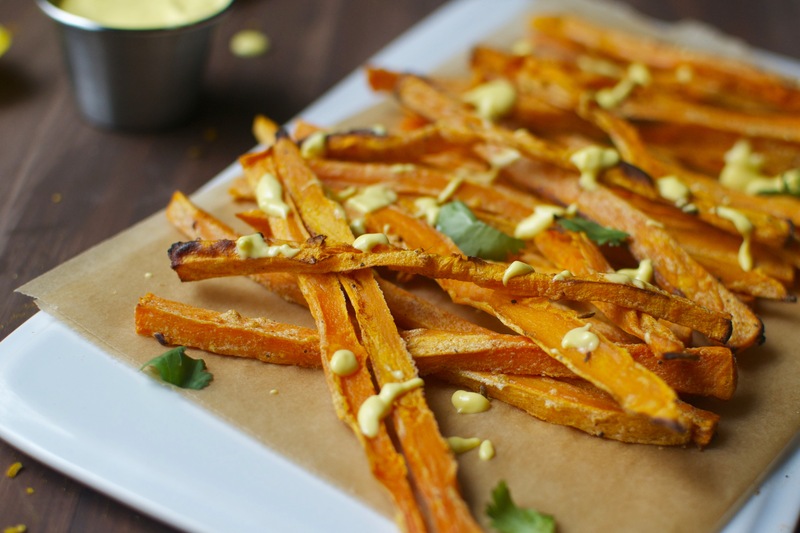 In a large bowl, toss the cut sweet potatoes with the melted oil, curry powder, and a sprinkle of salt and fresh cracked pepper. Place the potatoes on the sheet trays, evenly spaced and not overlapping each other. Bake in the oven about 30 minutes, flipping the fries half way through. Depending on your oven, it may take more or less time. When the fries are golden and cooked all the way through they are done! While the potatoes cook, peel and dice up the mango. 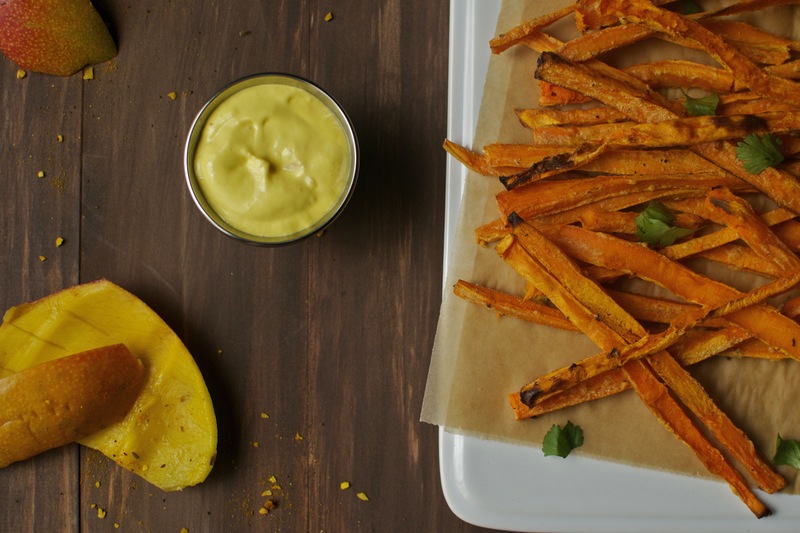 Place the mango, mayo, ginger, and 1 tsp honey in a blender and blend until smooth. Taste, and add more honey as needed. When the potatoes and mayo are done, serve together! Have you tried shakshuka https://www.youtube.com/watch?v=eCNpD2ZGcoo ? I was thinking about making it so Is it any good?